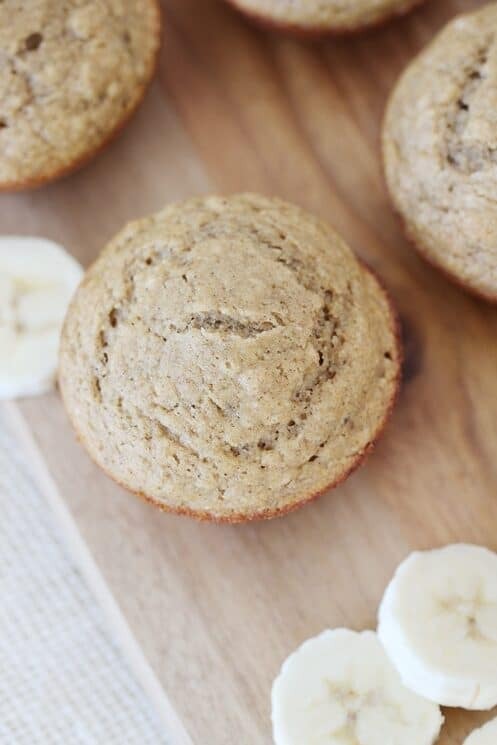 These banana muffins are super moist, soft, and fluffy, with a perfectly sweet banana flavor; BUT with less sugar and oil than most other banana muffins! 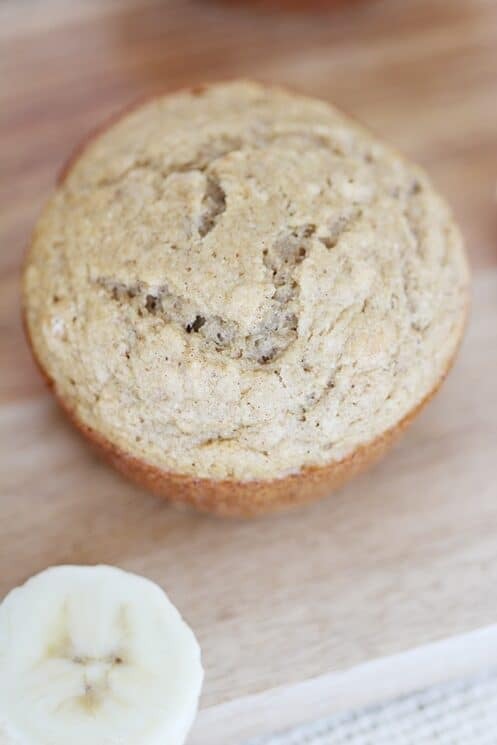 The perfect banana muffin is light, fluffy, and moist, and has a golden brown outside edge. It also has plenty of sweet banana flavor with every bite. 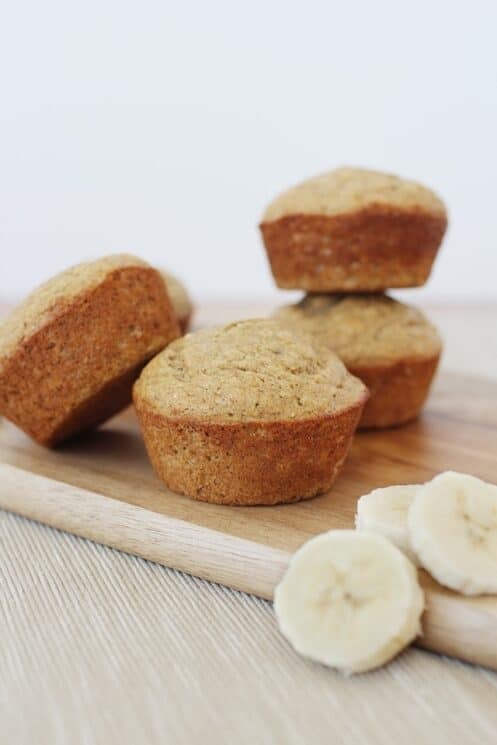 These are the tips we have found to help you make a delicious and healthy banana muffin. Fill your muffin tins nearly full if you want a high-domed muffin. Fill any empty tins half full of water. Make sure that your batter is thick. If your batter is too thin and you fill the tin to the top, it will run over before it sets. Your batter should be spoonable, not pourable; so add a little more flour if you need to. Your muffin pans should be heavy and dark and nonstick. We prefer making muffins without liners for this recipe. Just make sure you spray each muffin tin cavity so that your muffins don’t stick. You need a way to measure out the same amount of batter for each muffin tin. Two scoops with this scoop fills your tin exactly to the top. You want your bananas to be mashed really well. In this recipe, you actually blend the wet ingredients together in a blender. This gives you the smoothest texture ever, which we have found kids really love the best. When you are using bananas for baking, you want to make sure they are really ripe. But how ripe should they be? Can a banana be too ripe to use? 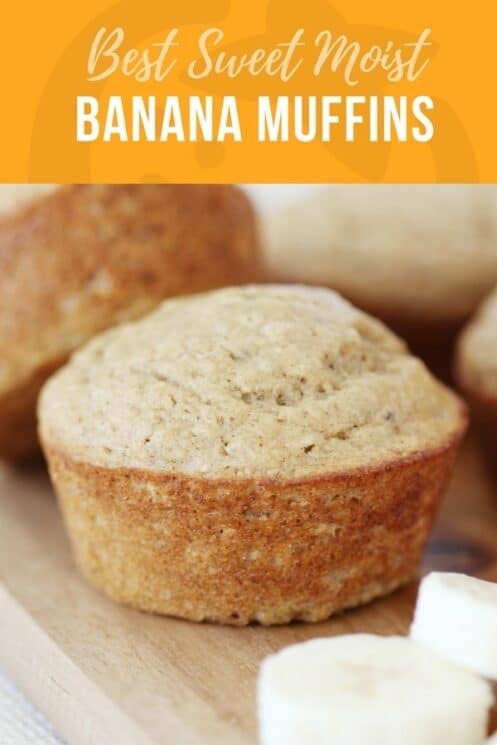 What if your bananas aren’t ripe enough but you want to use them to make muffins? Read on to answer these questions. How Ripe Should Bananas Be To Use for Baking? It might be tempting to use a banana for baking that has started developing a few brown spots. But it is not ready yet! 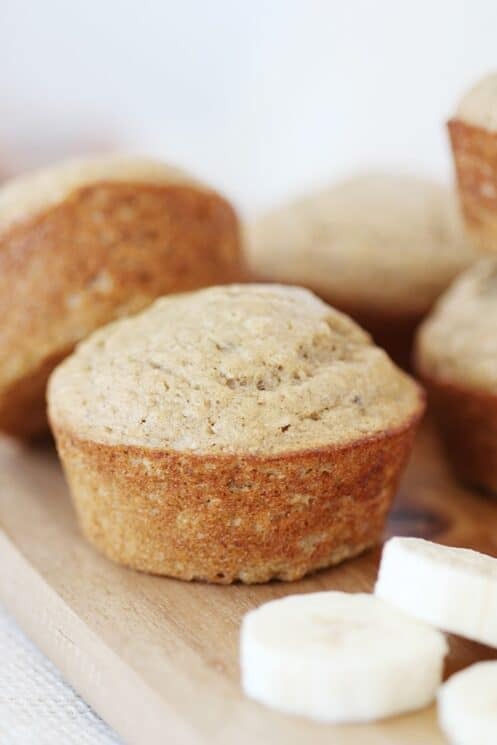 A banana must be really ripe — nearly all brown to give you that luscious banana flavor in banana bread and muffins. So just be patient and let those bananas do their ripening thing. For the sweetest possible banana bread/muffins/smoothies/etc, let the banana peel turn completely black, and then use the banana before the insides turn to dark brown or black since that means the banana is going bad. Leave the bananas together in the bunch. They ripen faster together than separate. Place bananas in a brown paper bag and close loosely. Ethylene will build up and circulate within the bag, speeding up the ripening process. You can also put a ripe fruit such as an apple or tomato in the bag as well. These other fruits also emit ethylene and will speed up the bananas ripening even faster. Can your Bananas Be Too Ripe To Bake With? When your bananas are completely black and the inside is very brown this is when they can start to go bad. They are likely too ripe when there is a fermented and alcoholic smell. One thing to know is as bananas ripen, the starch in the banana is converted into sugar. This process keeps going until all of the starch is converted to sugar which makes the banana more mushy but also a lot sweeter and perfect for baking. This is why black bananas are often preferred for breads and muffins. When the peel has turned black, the banana has converted almost all the starch to sugar and has gotten as sweet as it can before it goes bad. How healthy a muffin is all comes down to the ingredients you use. A muffin can be just like cake if you use lots of sugar, oil and other processed ingredients. Here are a few tips for making a healthier muffin. Decrease some of the fat. Usually just 3 to 4 tablespoons of oil or butter for each batch of 8 to to 12 muffins is enough to keep your muffins tender, moist, and tasty. 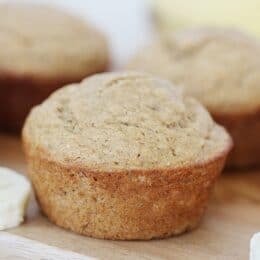 Use half whole wheat flour, white whole wheat flour or whole wheat pastry flour Replace half the all purpose flour in your muffin recipe for any of those options. They will add fiber and lots more vitamins and minerals. Add fruit to replace some of the oil or butter Using your favorite fruit or vegetable puree (pure canned pumpkin, applesauce, mashed bananas) can replace the same amount of oil (up to half) in your favorite muffin recipe. This will increase the nutrition, moisture, tenderness and natural sweetness of your muffins. Add healthy add-ins to boost nutrition Berries, chopped fresh fruit, dried fruit pieces, shredded carrots, shredded zucchini and mini dark chocolate chips are all good sources of vitamins and minerals and extra fiber. Use yogurt or buttermilk. These ingredients add moisture, but also protein and vitamins and minerals. Yes! Muffins are a great food to freeze. We usually double the batch we make and freeze the second batch for later. They are great to pull out of your freezer for a quick breakfast or even an after school snack. These are the tips we have found that work best for freezing muffins. Allow muffins to cool down to room temperature after freezing. Place muffins flat on a tray and freeze for about an hour, until solid. Transfer muffins into a freezer bag and keep in freezer up to three months. Thaw at room temperature. This takes about 30 minutes. In a microwave, place unwrapped muffin on a napkin, microwave-safe paper towel, or plate. Microwave on HIGH about 30 seconds for each muffin. In a conventional oven, wrap muffins in foil. Heat at 350°F and bake 10 to 15 minutes, depending on the size of the muffins. Preheat oven to 400 degrees F. Add 18 liners to muffin tins. Set aside. Mix almond milk, eggs, sugar, bananas, coconut oil and vanilla in a blender until smooth. In a large mixing bowl, stir together cinnamon, flours, baking powder, baking soda and salt. Make a well in the middle of the flour and pour in the wet ingredients while gently mixing together. Stir just until combined. Pour batter into muffin cups filling 3/4 full. Bake for 15-18 minutes or until a toothpick inserted comes out clean. Allow to cool for 5 minutes before serving. 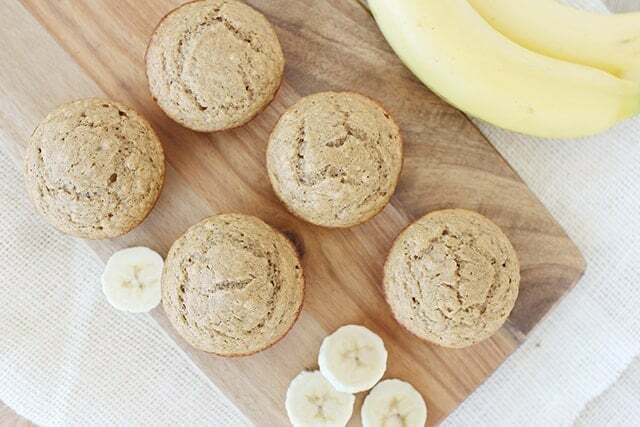 Banana muffins is one of my favourite dish because it helps to burn some fat and helps me to loose weight. Could you replace the almond milk with regular milk or coconut milk? Great recipe! I used whole milk instead of almond, honey instead of sugar, white flour for all of it and then added 7 prunes to the blender mix. My toddler loved it! Thank you from one mama to another. I’m so glad to hear this Ziba, thanks for sharing!